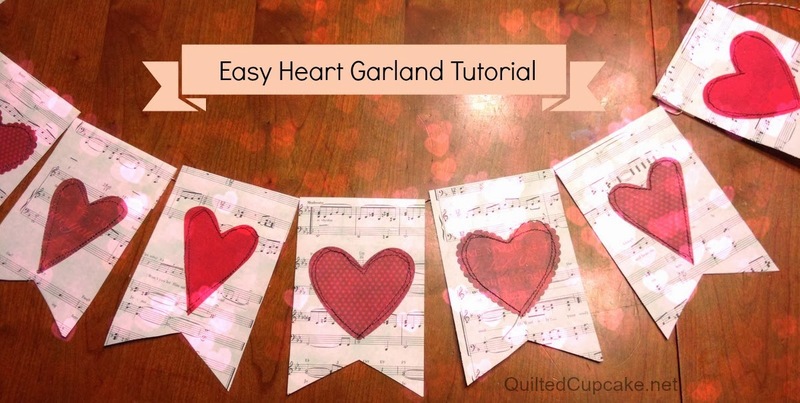 As promised in the earlier post, I’ve created a new DIY craft tutorial for an easy Valentine’s Day heart banner. This simple garland is easy to make and adds instant vintage charm to your home. The flag style pennant is a great Valentine’s Day craft, but you could really use it year round. I love the combination of vintage sheet music found at a thrift store with modern printed scrapbook paper. See full instructions below – please feel free to share with friends or on Pinterest. Save the template image jpeg below to your computer (right click and save as a jpeg). You can also download it here at my Scribd page. Paste the template jpeg into Word, Paint, whichever program you use. If you’d like your banner to be the same size as mine, increase the size until it fits the dimensions listed. 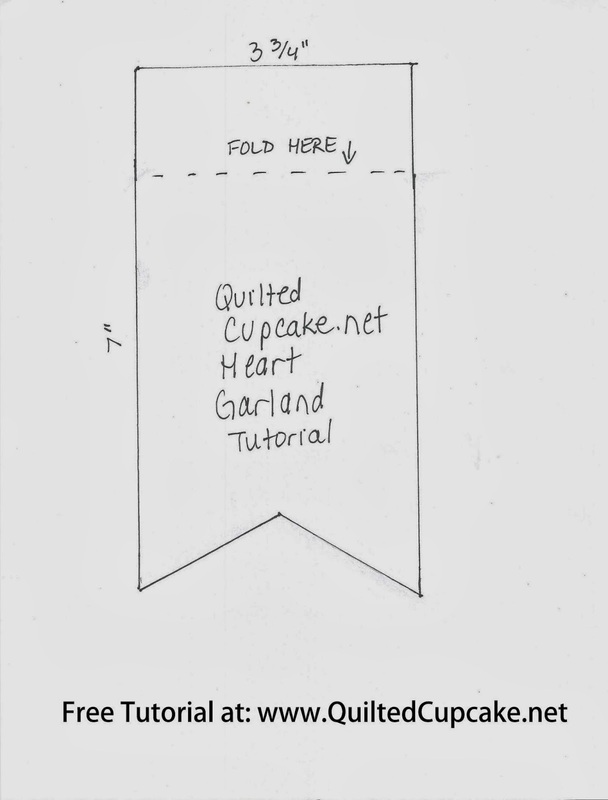 You can make the flags any size you like – just adjust the size of the heart. Print out the template onto cardstock, and cut it out. Trace the template onto the vintage paper, and cut it out. I used 12 flags for my banner. 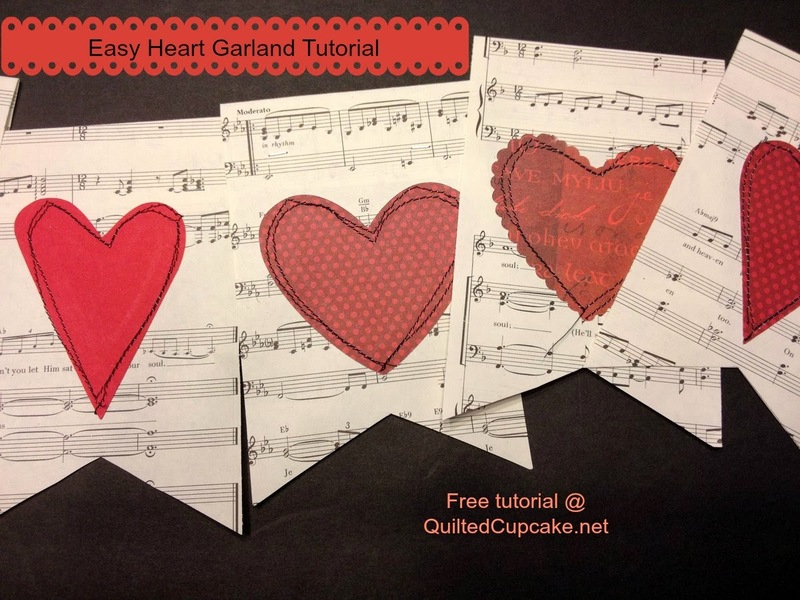 Cut the same number of hearts from your choice of paper – I used red, you can vary it however you like 🙂 You can either freehand cut the hearts, or use a Cricut or punch cut them out. My new Cricut Expression 2 made quick work of these hearts. Adhere the hearts to the bottom of the flags (see photos for placement – remember you’ll be folding over the top, so you want the hearts closer to the bottom). I used a small bit of glue stick in the middle of each heart. Using black thread, sew around the outline of each heart twice. I promise it won’t hurt your sewing machine – that’s my expensive Janome I’m using there – no problems. For some reason, sewing twice delivers a better look than just once. Following the template, fold over the top of each flag along the dotted line. You’re folding about 1 inch of the paper to the back to create a pocket for the string. Overachievers could sew the pocket across, but I chose to go fast and easy, and closed each with a few staples. String along baker’s twine, cotton string or yarn of your choice. To make this a bit easier, I insert a crochet hook into the side of the pocket, and pull the yarn through each. I hope you enjoy this tutorial – please share any projects you make with me. I’d love to showcase them on my Facebook and Pinterest pages. Click around and check back soon – more fun garlands and banners on the way – I’m a little obsessed right now. 🙂 I even have several in my Etsy shop.